Phillips Watches isn’t resting on its laurels while prepping the sale of Paul Newman’s Rolex Daytona and other amazing pieces in its New York “Winning Icons” sale next month. The auction house, which is quickly becoming a contender for the title of top collector watch auctioneer, has another collection of impressive timepieces slated to cross the block on Nov. 11 at Geneva’s Hôtel La Réserve. In association with Bacs & Russo Phillips’s Geneva Watch Auction: SIX. While a pair of exquisite $3 million Patek Philippes are bound to get most of the attention, what caught our eye was a duo of ultra-rare Panerai models from the ‘40s and ‘50s that are some of the most historic and important Panerais ever sold. The estimates look low on these beauties, so if it’s an indication that the market for antique Panerais is softening, we’d say it won’t last and savvy Panerai collectors should get busy with the auction paddle – not least because it may be years before watches like these become available again. 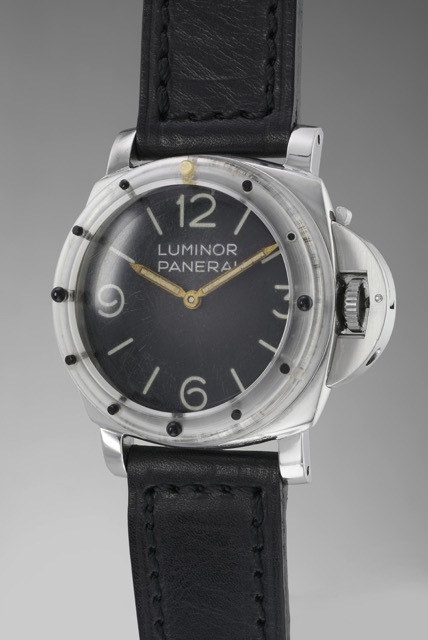 Here is the Rare Panerai Luminor Ref. 6152 that will be on the block. The big draw is a Panerai Luminor Ref. 6152/1 manufactured circa 1955. Unlike the latest releases of the Panerai collection these historical watches are connected to one giant swiss watchmaker. Like all Panerais from this early era, it features a movement and case by Rolex. And this example is extra important because it was formerly owned by Admiral Gino Birindelli, a true hero of the Italian Royal Navy, which originally commissioned the Luminor for its elite Decima MAS underwater commandos. Admiral Birindelli was a commander of the Decima MAS during World War II, was later made chief of the fleet of the Italian Navy and received the Gold medal of military valor among other distinctions. He himself rode the famous manned torpedoes that did such damage to the British Navy during the war. Estimated at up to $165,000, his watch features an unbelievably rare transparent polycarbonate bezel, graduated to five minutes, made for timing crucial missions. This is one of only four known Ref. 6152/1s with its original bezel as they are incredibly fragile. The Panerai 3646 is simple in design. Nearly as important and appealing is an even older Panerai, a Ref. 3646 made circa 1942. Estimated at up to about $95,000, this stainless steel Radiomir-style model is known as a “Type C” and features longer fixed lugs, and an inside caseback signed Rolex S.A., along with the reference number and serial number. There are only 211 known examples of the Ref. 3646. 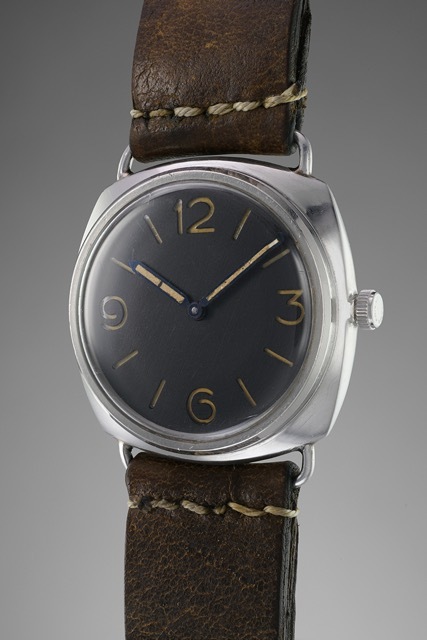 The example on offer features Panerai’s signature sandwich dial but without a maker’s name or model designation. There has been some evidence suggesting Panerai did this deliberately this so that any commandos captured by the enemy would not have their origin betrayed by their wristwatch. Again this watch has an extremely interesting provenance, and was formerly owned by combat swimmer Helmut Rösel, who was awarded the German Federal Cross of Merit. The multimillion-dollar Pateks may be more valuable but there’s nothing cooler than this pair of Panerais.